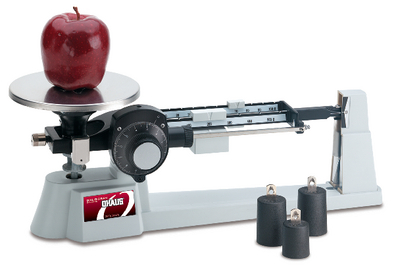 Dial-O-Gram® balances save valuable laboratory time. The tiered beam, zero adjust, and magnetic damping ensure high-speed efficiency and reduce errors. Convenient direct-dial reading, two beams and poises, protected agate bearings, and steel knives allow for trouble-free weighing. Dial calibration is 10 x 0.1 g, the middle beam is 500 x 100 g, the back beam is 100 x 10 g, and the tare (front) beam is 225 g (ungraduated). Accessories information: Capacity can be increased with an optional weight set (one 500 g and two 1000 g). Ordering information: This product includes a 60-day manufacturers' warranty.